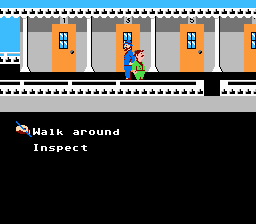 Mississippi Satsujin Jiken is an adventure game for the Nintendo Entertainment System. 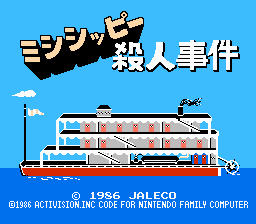 This is an English translation patch for Mississippi Satsujin Jiken, the Famicom port of a Western 8-bit computer game named Murder on the Mississippi. The original game was released on the Apple and Commodore 64/128 by Activision while the port was released by Jaleco, all in 1986. 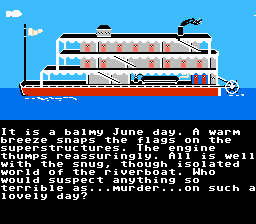 It is a Western-style adventure game wherein the main character is an accomplished British detective who investigates a murder aboard a Mississippi riverboat that he coincidentally happens to be on. 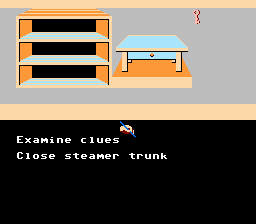 The game uses a fairly simple interface to interact with the various objects and suspects on the boat, and is pretty short once you know what to do, though getting to that point is not an easy matter. The port is rather slapdash and is missing a fair chunk of gameplay as well as an entire character, and unlike the computer version, the port forces you down a much more linear path with frustratingly little hint that it’s doing so. 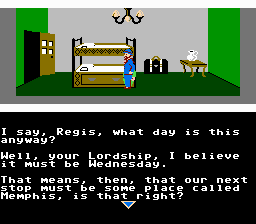 However, it still makes an interesting exercise in hacking and the game itself is still text-heavy by 1986 console standards.